My Hero Academia Vol. 16 Review – AiPT! There’s action and character development galore as the heroes hunt down Overhaul. When it comes to superhero comics there aren’t many series better than My Hero Academia. Notice I said comics and not just manga specifically. Kohei Horikoshi’s mixture of high school drama and superpowered melee stands out above its peers in both Japan and America. Naturally, the series’ latest installment is well worth being excited about. My Hero Academia Vol. 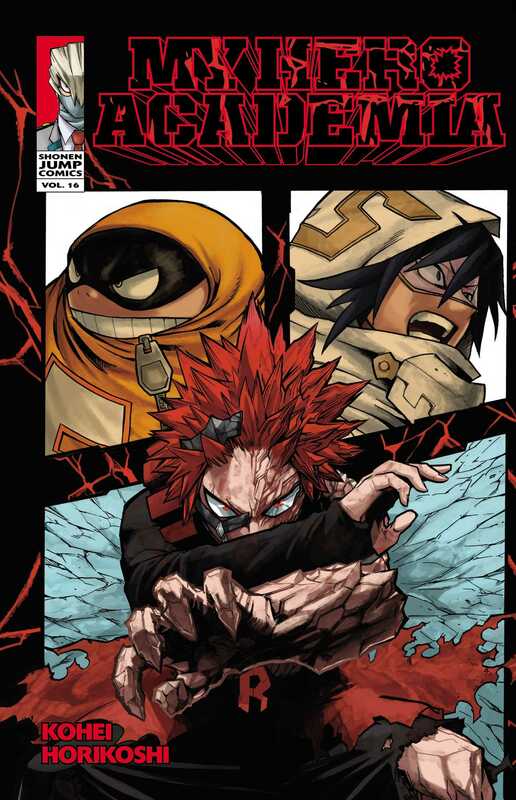 16, published by Viz Media, collects chapters 138-147. They depict the start of the heroes’ raid on Overhaul’s base, in which we get some strong focus on Suneater and Kirishima. Does this installment live up to the high expectations set by its predecessors? This volume is jam-packed with action and it’s a lot of fun. This is largely thanks to Horikoshi’s knacks for devising unique superpowers and having characters use even seemingly common powers in unexpected ways. Nowhere is this creativity more evident than with Suneater. His Quirk is essentially to morph his body parts to match those of any creature or substance he has recently eaten. When he eats octopus, for instance, he can shift his arms into gigantic tentacles, complete with venom. It’s an off the wall ability with a lot of internal variety, which helps keep things unpredictable and thus more exciting. The action is also enhanced by Horikoshi’s grand sense of scope. His page layouts usually convey differences in characters’ and objects’ sizes very well, helping give the various showdowns an epic tone. As great as most of its action is, this volume shines brightest in terms of its characters. We get some flashbacks to Suneater and Lemillion’s past as childhood friends, and these help flesh out both characters significantly. We get a better sense of Lemillion’s motivations, which help make the Superman-esque character more relatable. Suneater, meanwhile, grows beyond his introduction where he was more or less just a source of anxiety gags. These developments are all satisfying, but not as much so as those pertaining to Kirishima. His flashbacks are also of his childhood, but they strike at the core of his desire to be a hero. We see a turning point in his life where, having failed to adhere to his own heroic ideals, he makes the changes necessary to uphold them and to get into U.A. It’s a great character arc, and one that makes him even easier to root for in the present day. There’s not much to list off here in terms of cons. My main qualm is just that the action can get a bit difficult to follow at times. It’s never unclear to the point that you have no idea what’s happening, but the exact trajectories of characters and attacks sometimes blend together a bit too much. Aside from this, I wish that Overhaul’s flunkies were a bit more memorable. They don’t get much time to shine and leave individual impressions, which makes them seem semi-interchangeable. Overall, My Hero Academia Vol. 16 is a great read. The action is thrilling to watch thanks to Horikoshi’s creativity, and several characters reach new levels of both coolness and depth. There are some cons (occasional clarity issues, interchangeable villain flunkies), but they don’t hold the manga back very much. This volume is definitely worth checking out. Creative action sequences and enjoyable character development make this volume well worth your time.